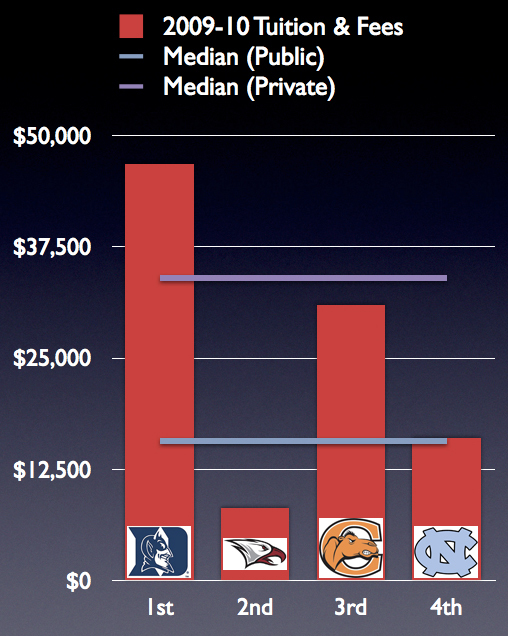 Something that was worth pointing out (at least IMO) is this chart I put together of the final 4 teams. 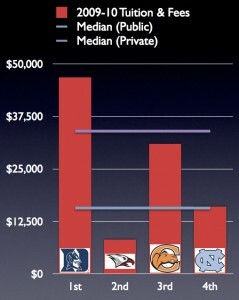 Now I know several of my Duke Law friends will argue with this chart — as some already have — claiming that the difference in cost of attendance is irrelevant, since their salaries at summer associateships and after graduation will more than make up for the extra law school expense. And they’re certainly right… to an extent. The folks over at Fight the Hypo wrote this entry on the topic of ROI a few weeks ago. Congrats on the second place finish. That’s pretty darn impressive. I was @ the Thurgood Marshall competition this weekend. NCCU must have a great mock trial program because they were 3rd at our competition. Do you think you will keep going with mock trial or try journal/moot court? I was planning to go the journal/moot court route because they both seemed more cerebral, and when I worked in BigLaw the highlight of my time was drafting a brief and corresponding oral arguments that the partner I worked for actually used (and won). Wow, you did great! Congratulations! !